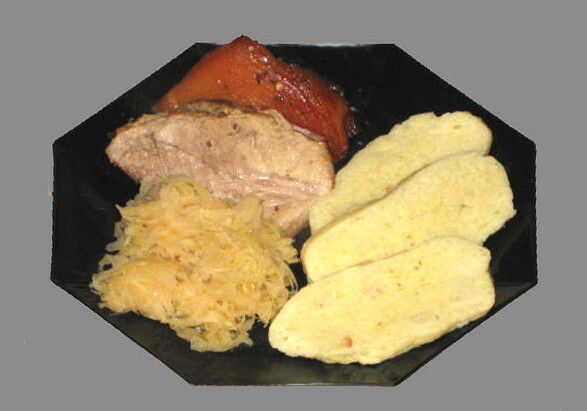 Dumplings served with pork roast and sauerkraut. To Czechs and Slovaks, bread dumpling is what pasta is to Italians and rice to whole Asia. It is almost a daily staple served with any food that has a sauce. Basically, it is just yeast bread with stale bread cubes mixed in. The “bread” in the name refers to these bread cubes. 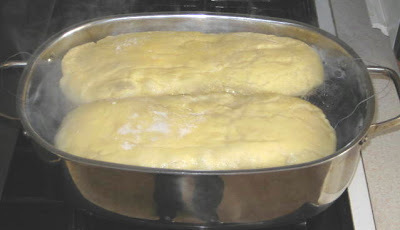 There are two ways to make them light and spongy: yeast and double acting baking powder. Since I have never made them with baking powder I will stick to the more traditional yeast dough. I should mention that you will need fairly large pot to boil them. I use my deep stainless steel 9”x14” oval roasting pan, just a perfect size to boil 2 dumplings. You can use regular enameled steel roasting pan, of course. Also, I would recommend to boil only one dumpling at the time since they have to be cut in half as soon as they are removed from the water and pierced with long bamboo skewer to release steam. 1. Microwave milk with pinch of sugar and let cool. 2. Beat eggs and add to cool milk. 3. Mix flour with milk & egg mixture for ½ minute then add yeast. 4. Knead in mixer till sides of bowl are clean. 5. Place on work table and add bread cubes. Knead by hand till smooth and elastic. 6. Divide into two equal parts, roll into an oblong shape and place on large tea towel sprinkled with flour to prevent sticking. Cover with another towel and let raise till double in volume. 7. Lift the dumpling carefully with the bottom tea towel and gently lower into a large pot of boiling salted water. Be careful not to collapse the raised dough. 8. Boil for 13 minutes on one side then turn and boil for additional 10 minutes. 9. Remove from boiling water and immediately cut in half and pierce in several places with skewer to release steam. Place on a baking sheet or plate with cut side down and cover with towel till ready to use. To serve, cut slices about 1/2” thick. The halves of dumplings freeze very well. To use frozen dumplings, just let them thaw, slice and steam for few minutes. I have roasting rack with wire loop at each end to lower and remove the dumplings. The rack came with the pan so it is a perfect fit. Interesting... and a thrifty way to use up stale bread. Next time I make something with lots of gravy I'll keep them in mind. Thanks for posting! Thanks Ferdzy. You just gave me a great idea to start diet with Italian bread soup! Now, that's a frugal way to use bread! Lots of leftover baguettes. I can't wait! Thanks again.